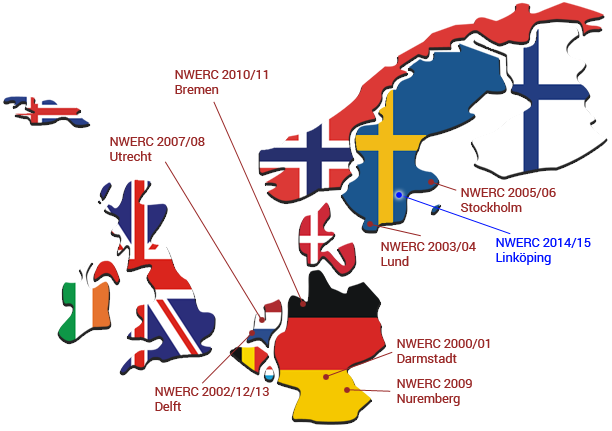 Welcome to the website for the Northwestern Europe Regional Contest 2014 (NWERC). NWERC 2014 is hosted by Linköping University and will take place November 29-30. NWERC 2014 took place on November 30th at Linköping University, Sweden. A total of 95 teams from 48 universities in 9 different countries competed. The winners are Lambdabamserna from University of Copenhagen, Denmark, with 9 solved problems in 1298 minutes. In second place came Old Fafhioned Typefetting from Friedrich-Alexander University Erlangen-Nuremberg, Germany, with 9 solved problems in 1462 minutes and in third place Omogen Heap from KTH, Sweden, with 8 solved problems in 747 minutes. Primary sponsor was IBM with Microsoft as Platinum sponsor and ING as Gold sponsor. Packaged problems including testdata, solutions, wrong solutions, output validators, input generators, etc. All materials are copyright 2014 by the NWERC 2014 jury. They are licensed under the Creative Commons BY-SA v3.0 license. NWERC 2014 is an official regional contest in the ACM International Collegiate Programming Contest. It draws students from colleges and universities throughout Belgium, Luxembourg, Great Britain, Ireland, Iceland, Norway, Sweden, Finland, Denmark, Germany and the Netherlands. The winning team will advance to the ACM ICPC World Finals.